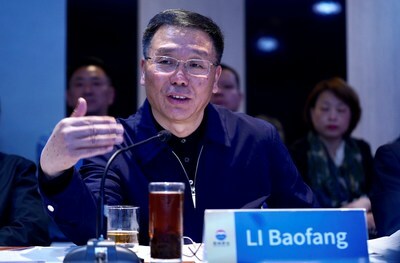 Moutai chairman: "We will make Moutai products available in every corner of the globe"
SANTIAGO, Chile, April 12, 2019 /PRNewswire/ -- "Not only did the brand originate in Guizhou, Moutai is also the pride of both China and the world", said Kweichow Moutai Group chairman and general manager and party committee secretary Li Baofang at the South American dealer forum held on the morning of April 7 (local time). He then added: "Moutai is going global in response to the Chinese government's One Belt, One Road initiative, in line with China's overall global strategy and in a move to build a Chinese brand with real influence worldwide." The forum was held at the Santiago Marriott Hotel in Chile's capital. Seven dealer representatives from Argentina, Chile, Panama, Peru, Suriname and other Latin American countries outlined the market growth in their respective countries. "All of you here are both explorers and pioneers"
Mr. Li cut right to the chase at the beginning of his speech when he said "I would like to extend my thanks to all of you for bringing Moutai into South America. With your efforts, we introduced the Moutai brand, an important part of Chinese culture, to countries across the region. I think all of you here are both explorers and pioneers." At the forum, Andres Toscanni, a sales manager from the Uruguay dealership, sounded quite optimistic about the market prospect for Moutai in Uruguay when he said "South Americans are not people to hold back with their feelings and emotions and they like to have their daily drink. As Moutai becomes more known in Uruguay, our audiences will gradually develop a taste for the brand." Mr. Li heartily agreed with Andres' statement, adding, "It is a landmark turn for locals to manage the distribution of Moutai in a local way. We would like to extend our gratitude to the South American dealers for everything you have done. Through this forum, the staff at Moutai have the opportunity to not only know how you conduct your business, but also understand the market and basic set up in your country." "Doing well with Moutai can also enhance your local influence. This is a product that can bring together strong social resources, with the result being, whether at home or abroad, adding Moutai to your portfolio is an excellent career move." Moutai expanded its presence into South America in 2005, when the Chilean Chinese-owned import and export firm Seis Luces S.A., became Moutai's first dealer on the continent. Seis Luces general manager Yang Peizhi read from a few sheets of paper on which he had drafted his speeches in a softcover notebook. He said he was only moving 200 cases of liquor the first year after entering the South American market. Last year, his company sold 2,000 cases of Moutai, a ten-fold increase from 14 years ago. With years of ongoing expansion, Moutai has built a network of seven dealers in six South American countries, which made up 1.5 percent or 33 tons of the company's overseas sales, a number that increases on average by 3 percent year-on-year. Sales in the region totaled 44.76 million yuan (approx. US$6.7 million), making up 1.5 percent of the company's overseas sales and growing 22 percent year-on-year. Moutai is well on track to vastly expand its footprint across the South American market. Mr. Li said, "Not only did the brand originate in Guizhou, Moutai is also the pride of both China and the world." 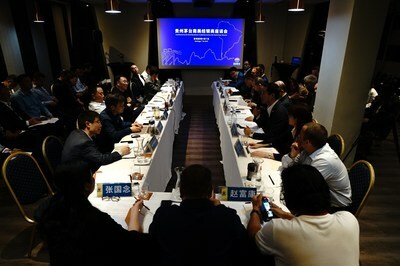 He indicated that unlike several Chinese products with distinct regional characteristics, Moutai is both an iconic national brand and an international brand. He added, "As a result, we are making efforts to transform Moutai into a truly global brand with product available in every corner of the globe." Mr. Li believes that Moutai helps promote Chinese culture across the world. "Let the world fall in love with Moutai by making the beverage available everywhere. In line with China's growth strategy, leading Chinese liquor brand Moutai expands globally and provides an important medium for cultural exchanges between East and West." "Moutai is a special intangible cultural heritage. Unlike the products manufactured in a state-of-the-art facility in developed Western countries, Moutai maintains its legacy and several elements that describe its tradition. Mr. Li said the dealers in South America should visit Moutai's facilities more frequently. Anyone who is in the business of producing any kind of liquor would have an interest in learning about Moutai's secret production process." "South America is a market that cannot be ignored by Moutai. Next, the Moutai delegation will continue its tour of South America to further promote the growth of the brand." "With limits in production capacity, Moutai, a kind of scarce resource, is now in short supply in overseas markets. Everyone at Kweichow Moutai Group values the contribution that they make, while we strive to provide a favorable environment for anyone seeking personal growth." Mr. Li concluded his speech with applause from the audience.